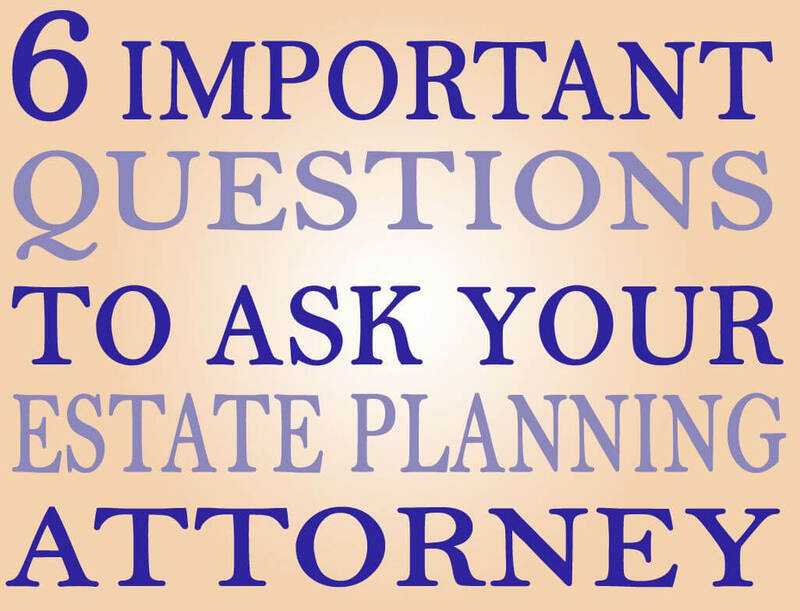 6 Questions to Ask When Hiring an Estate Planning Attorney | The Ashmore Law Firm, P.C. Selecting a qualified estate planning attorney is important. Once you have selected an attorney, you will be working and communicating with that person for many years to come. Have these 6 questions ready when you speak with an attorney. 1. What will happen during an initial meeting with your office and how much will it cost? When you make your initial call to the office of the attorney, pay attention to how the phones are answered by the office team. You want a live person answering the phones, who can answer quick questions for you when you are a client. During the call, ask if there is a charge and what to expect for the first meeting. The purpose of the first meeting with your attorney is to provide you with specific guidance and information that will benefit you and your family. When you leave the meeting, you want a clear action plan to ensure your financial and legal affairs are set up the best possible way for your family. You need to know what the cost is going to be--or at least a ballpark figure--when you hire your attorney, so there are no surprises. Find out if it is a flat fee and if there are any additional costs. 2. Does my planning fee include a regular review of my legal documents and any changes I want to make in the future? What about ongoing work after completion of my initial plan? With estate planning, you can’t set it and forget it. In other words, it is not a done deal as long as you are living. There will be changes in your family and financial situation throughout your life, and it is your responsibility to contact your estate planning attorney and make sure your estate plan is up to date. If it is not up to date and you die without the appropriate additions or deletions on your estate, the plan fails. Your estate plan is a living document that needs to be reviewed and updated throughout your life. You want to find an attorney who will keep everything up to date for you, review your documents regularly, and offer a program to provide you with continuing guidance on an ongoing basis. 3. How many years have you been practicing estate planning? Obviously, experience is one of the most important factors when choosing an attorney to represent you. As you can imagine, the longer the attorney has been practicing estate planning and probate, the better. 4. Are you licensed in the state of Texas? Make sure that your estate planning attorney is licensed in Texas to handle your situation. A lot of problems can arise if he or she is not. 5. Do you make sure my assets are titled in the right way? Make absolutely sure that the attorney you are working with is not only going to put legal documents in place for you, but also has all the correct information from you on your assets. To finish the job, your assets must be structured properly. If your assets are not titled and structured properly, it’s all a false sense of security, because those legal documents won’t work. 6. How are you able to respond to my needs on an ongoing basis? Make sure you ask your attorney how he or she will respond to your ongoing needs and how quickly calls are returned in the office. Find out if there is someone on hand to answer quick questions and if you should expect to get right through to your attorney when you call the office. A chief complaint many people have when working with an attorney is they do not get called back. Make sure the attorney has a team in place to respond to your call and answer any of your questions. Don’t be timid or afraid to ask these questions. This is an important decision for you to make before hiring an estate planning attorney. Taking care of your family and loved ones is one of the most important things that you can do. After all, your estate planning attorney will become an important part of your life as well. You must feel confident with the attorney you select. We are planning on hiring a estate attorney. We have never hired one before. So we are not sure what we need to look for in an estate attorney. This article was super helpful in answering my questions. Thanks so much for the tips and help .